Prehistoric quids—wads of masticated leaves found in dry rock shelters—are yielding DNA clues to the origins of framing in the American Southwest. A question mark has long hovered over human transitions from hunting and gathering to farming: did agriculture spread by communication—in archaeological parlance, by diffusion? Or did the early practitioners of farming migrate, carrying their technology with them, and displace native hunter-gatherers? 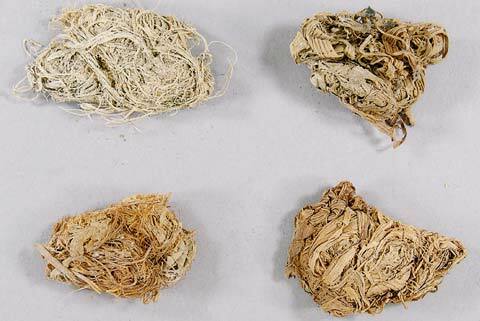 In the American Southwest, at least, a tentative answer may be in hand, stored in some of the most banal artifacts held by Harvard’s Peabody Museum: prehistoric wads of chewed leaves called “quids,” and thong-like “aprons,” fashioned from shredded juniper bark, stained with what is presumed to be menstrual blood. In an unusual cross-disciplinary collaboration funded by the provost’s office, the museum’s director of collections, Steven LeBlanc, teamed with Harvard Medical School’s Thomas Benjamin, a research professor in pathology whose lab normally studies mouse cancer, to recover DNA thousands of years old from the artifacts. They focused on mitochondrial DNA, which is passed from mother to child for generation after generation, and which exists in a thousand copies per cell, and extracted it successfully from about a quarter of the quids they sampled, and from a smaller fraction of the aprons. What they found in their small sample from an early corn-growing culture suggests that in this part of the New World, at least, migrating Uto-Aztecans from Mexico probably did not pass their technology to the indigenous hunter-gatherers, but instead out-reproduced and replaced them. LeBlanc says this theory—that farmers spread north from central Mexico—was advanced by Peter Bellwood of Australian National University in a controversial 2005 book, First Farmers. “Bellwood argues that this is a worldwide pattern of how farming spreads: by migration, not diffusion,” he explains. There were exceptions: places where “the foragers were either dense enough or close enough socially and technologically to the farmers that they were able to adapt. In Europe, it looks like the Basques are an example, and Scandinavia is an example,” LeBlanc says. Different geographical conditions—high altitude, or cold climates not conducive to growing crops—may have momentarily checked the farmers’ advance, giving hunter-gatherers on the other side of the pause line a chance to react. In the American Southwest, he notes, there is a Zuni-speaking population on the Arizona-New Mexico border that took up corn farming without being swamped by an Uto-Aztecan influx. LeBlanc describes his study as “one little piece of a very large chain of investigation,” but the work has nevertheless demonstrated the efficacy of using DNA analysis on objects held in museums. “The FBI does it all the time,” he says, “but archaeologically, this is the first time that anybody has ever done such a thing.” The earliest artifact LeBlanc and Benjamin studied was about 2,400 years old; whether the methodology is directly transferable to answer similar questions in Europe, for example, where farming’s spread began thousands of years earlier, remains unknown. An answer will also depend on what sorts of objects have been saved from excavations there.